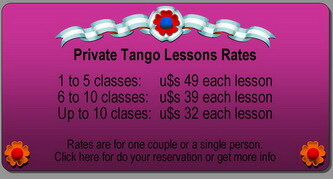 The Tango class must be funny, agile and also must allow the Tango do its seductive job. The person who is on holidays and wants to learn Tango, never has to be prisoner of a gimnastic class. The person who cames to do a Tango Workshop by a long time, more than ever has to connect to the deep behaviour of Tango and its silent dialogue, this is what will really made improve his/her technique. or visit their site (El Taller de Bucarelli), or check in our list Agendatango contacts of other teachers. Part V: Our 8 steps with the teachers Part VI: We're finally dancing!!! WOW! The following PayPal button is for do reservations AFTER get some human comunication with me or the teachers, please don't buy anything without previously agree with us the schedule and availability. We want you happy!